Installed on the fifth anniversary of James's death. 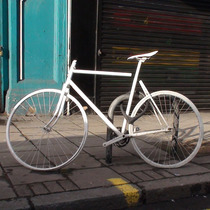 The bike was attached to a bike stand outside Mosquito Bikes, the bike shop where James worked. May 2012 we noticed that the ghost bike is no longer there.